FILE - Followers of Shiite cleric Muqtada al-Sadr, seen pictured on the poster, celebrate in Tahrir Square, Baghdad, Iraq, May 14, 2018. As the winning Iraqi political blocs enter a period of intense negotiations to form a new government following a general election, the United States faces new challenges to protect the gains made against Islamic State and prevent Iran from boosting its clout via Shiite militias in the new Iraqi government, experts warn. Iraq held elections to pick a new parliament and government on May 12 for the first time since the emergence of IS in the country in 2014. Results were announced last Friday by the election body, revealing an upset victory for controversial Shiite cleric and America's old foe, Muqtada al-Sadr, whose coalition took 54 out of 328 parliament seats. An Iranian-backed group, Conquest Alliance, finished second with 47 seats. U.S.-backed incumbent Prime Minister Haider al-Abadi, whose Victory Alliance got 42 seats, came in third. "There is no possible pro-American coalition that will win in Iraq. There is no solution," said James Jeffrey, who served as the U.S. ambassador to Iraq between 2010 and 2012. FILE - In this photo provided by the Iraqi government, Iraqi Prime Minister Haider al-Abadi, right, and Shiite cleric Muqtada al-Sadr hold a press conference in the heavily fortified Green Zone in Baghdad, Iraq, May 20, 2018. Jeffrey said the three most anti-American Shiite leaders — al-Sadr, Hadi al-Amiri of the Conquest Alliance, and former Iraqi Prime Minister Nouri al-Maliki, whose seats can add up to over 120 — will most likely exert much influence in the formation of the next government. "More importantly, they have the vast majority of the Shiite votes. The first rule that was made brutally clear for me in Iraq in 2010 is that a Shiite prime minister is the fate of the country. We can rail against that and point out what such an allocation of sectarian positions does to the country, but that is the reality of it," he said, speaking Tuesday at the Hudson Institute. To pick a prime minister to form a government in Iraq, a parliamentary coalition of at least 165 seats has to be formed. This means in the coming weeks the political scene in the country will see many rounds of negotiations, including from U.S. and Iranian officials who view Iraq politically essential. The U.S. has officially applauded the election process as successful and said it was willing to partner with a new, inclusive government. Asked whether officials in Washington were worried the election results could push Iraq closer to Iran, U.S. State Department spokeswoman Heather Nauert said last week that the U.S. trusted the Iraqi people. "That is certainly always a concern of ours, but we have a great deal of trust and faith in the Iraqi people and whoever ends up governing, whatever the structure is, the governing of that country going forward," Nauert said. U.S. officials in Iraq have already started rounds of diplomacy to discuss what the next cabinet will look like. Brett McGurk, U.S. envoy for the global coalition against the Islamic State, has met with several officials in Baghdad and the Kurdistan region. U.S. efforts have reportedly included approaching al-Sadr, whose men — once organized as part of a militia known as the Mahdi Army — are responsible for the deaths of hundreds of American soldiers. 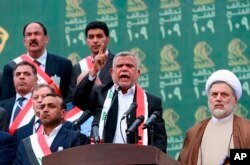 FILE - Hadi al-Amiri, center, speaks to his followers during his political block campaign rally in Baghdad, Iraq, May 7, 2018. According to Dhiaa al-Asadi, a top al-Sadr aide, the U.S. has made no direct talks with al-Sadr, but intermediaries have been used to open channels with members of his Sairoon Alliance. "They asked what the position of the Sadrist movement will be when they come to power. Are they going to reinvent or invoke the Mahdi Army or re-employ them? Are they going to attack American forces in Iraq?" al-Asadi told Reuters Tuesday. The U.S. Department of Defense acknowledged it has 5,200 troops in Iraq now. They are mostly training and advising Iraqi forces to help prevent IS from regrouping in the country. Al-Sadr pushed a strong anti-American and sectarian agenda after the 2003 U.S.-led invasion of Iraq. His militiamen killed hundreds of Sunnis and continued to clash with U.S.-led forces until former U.S. President Barack Obama's decision to withdraw U.S. forces from Iraq in 2011. But the cleric has backed away from that stance and portrays himself as a nationalist defying sectarianism and fighting corruption. He also started to speak out publicly against Iran's influence in Iraq, and tried to establish friendly relations with Sunni Arab countries in the Gulf region. Given its closer ties to Iran's Islamic Revolutionary Guard Corps, led by Qasem Soleimani, experts say the Conquest Alliance will most likely present a greater danger to U.S. interests in Iraq. "It is the Conquest Alliance that is more disconcerting to me. That is to say, this is the group by Amiri who's got some Iranian-backed militias inside them," said Denise Natali, an analyst at the National Defense University. The Conquest Alliance is an umbrella bloc for several militia groups of the Shiite Popular Mobilization Forces (PMF) that rose to prominence during the fight against IS. It includes U.S. terror-designated militias, such as Asa'ib Ahl al-Haq and the Badr organization, and Iranian-friendly parties such as the Islamic Supreme Council of Iraq. 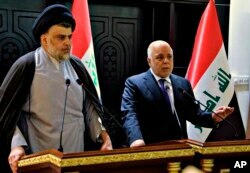 "Al-Sadr is at least an Iraqi nationalist to his core. But nonetheless, where and what role Conquest Alliance is going to play in this future will be my concern," she said Monday, speaking at the United States Institute of Peace.